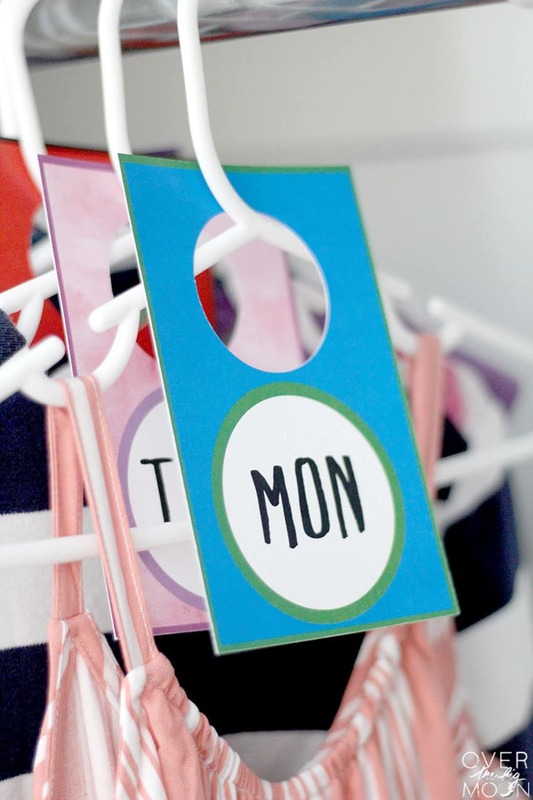 These Days of the Week Clothes Tags are the perfect way to help kids organize their outfits for the week! 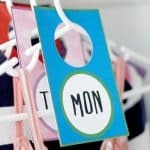 Use Cricut’s Print then Cut feature to make these hanging tags! 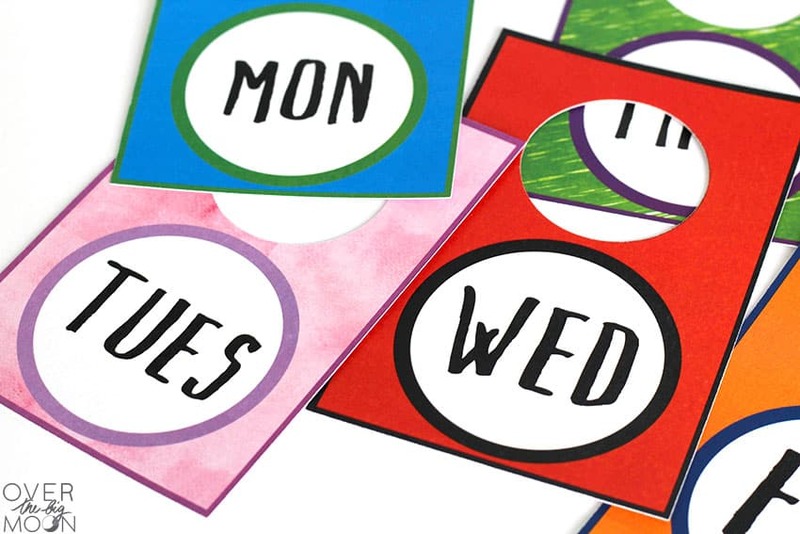 Super simple and easy to customize! As my daughter gets older, I am wanting her to become more independent in the getting ready for the day department. But, the girls fashion sense can be a little much for school! haha! During the summer I generally let her choose whatever she wants, but for school days we try and tone it down a bit. 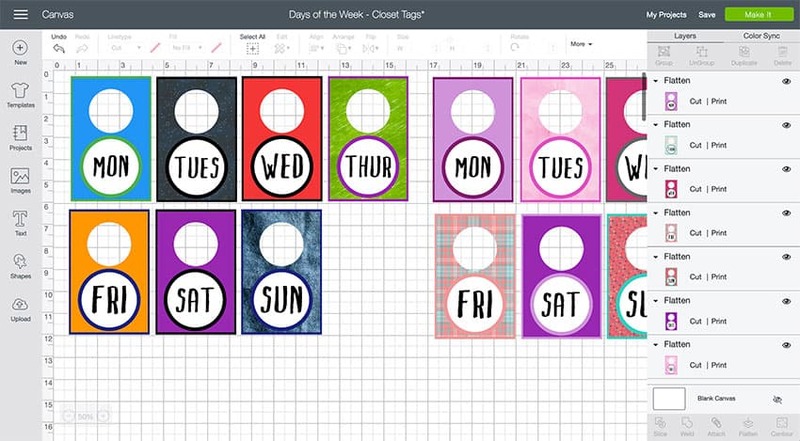 To help her keep some of that independence, we created these Days of the Week Clothes Tags in Design Space. 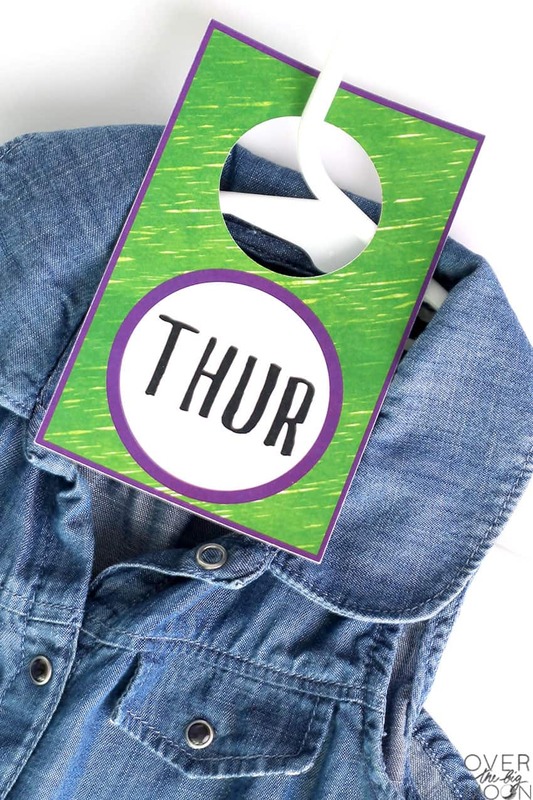 Each Sunday, we choose her outfits for the week and then she gets to choose what outfit she is going to where what day and she puts the tags on them! Having her part of this process makes her feel like she’s still in control! 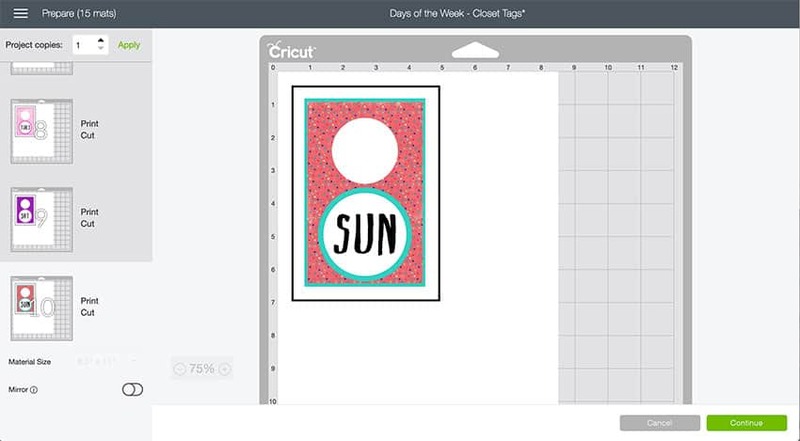 If you’ve never used Cricut’s Print then Cut feature, I suggest clicking over to this article on How to Use Cricut’s Print then Cut Feature. 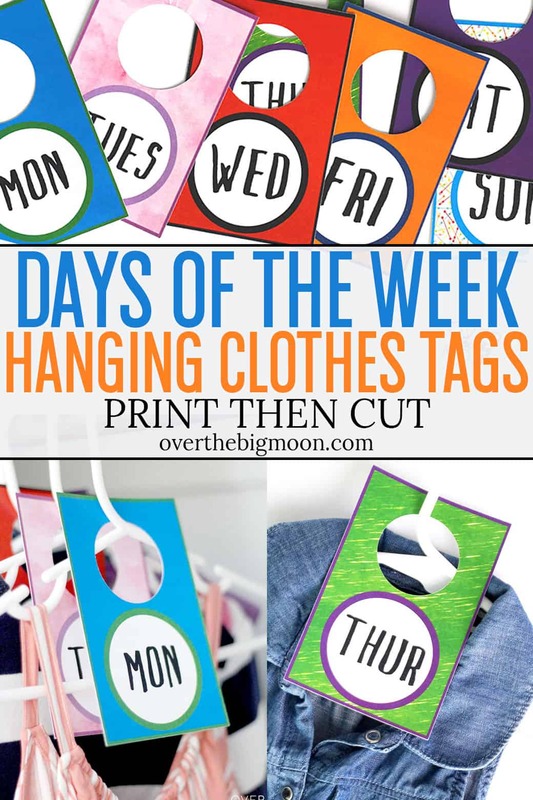 The tags can be printed on cardstock, cut on the Cricut Maker and then used or printed on cardstock, laminated, cut on the Cricut Maker and then used! 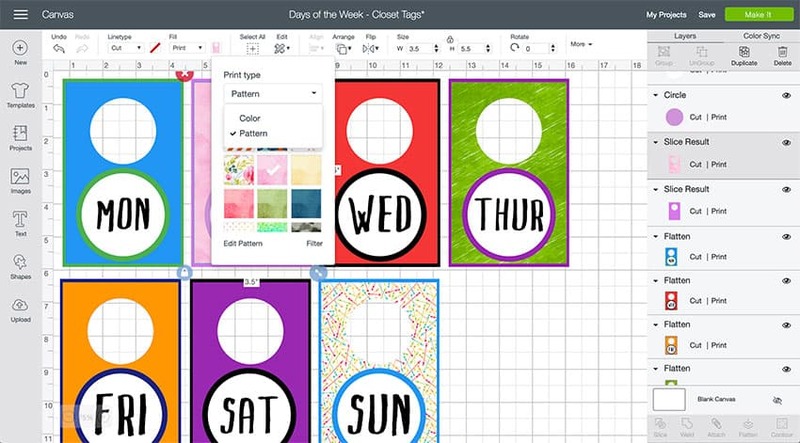 Start by opening the Clothing Tags Design Space File! I have two different sets of Clothing Tags designed! Feel free to pick and choose the colors/patterns you like and want to use! You can also easily customize or change any of the tags. Currently each tag is FLATTENED in Design Space. If you want to change the colors, just click the tag and then click UNFLATTEN in the bottom right hand corner. Then you can change anything you want to. Once you’re done, you need to select all the layers and hit FLATTEN in the bottom right hand corner. Don’t forget that you can also add patterns to the tags! 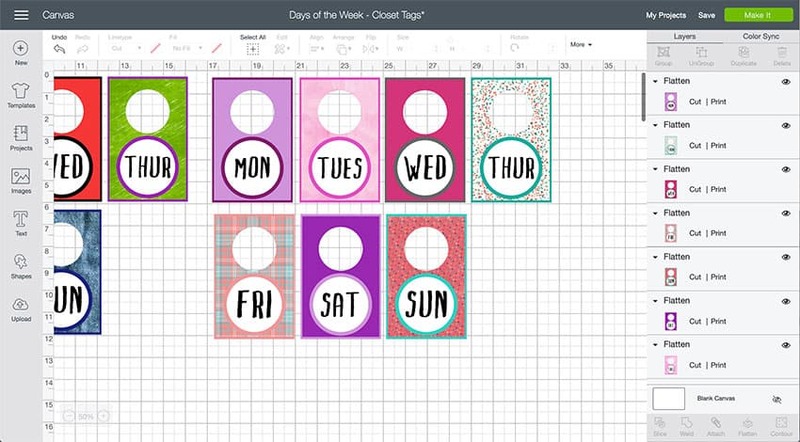 You can do that by hitting on the fill and then using the dropdown menu and choosing PATTERN. Once you’re done, hit MAKE IT in the top right hand corner. You will then preview all your mats. If for any reason your mats don’t look like the mat below, it most likely means that you have a tag that isn’t FLATTENED. Just hit cancel and go back and confirm all the layers are flattened. Because of the size of the tags, only one tag will fit per page. Side note: You could make the tags smaller if you want two to fit to a page. Once all the mats look good, hit CONTINUE in the bottom right hand corner. 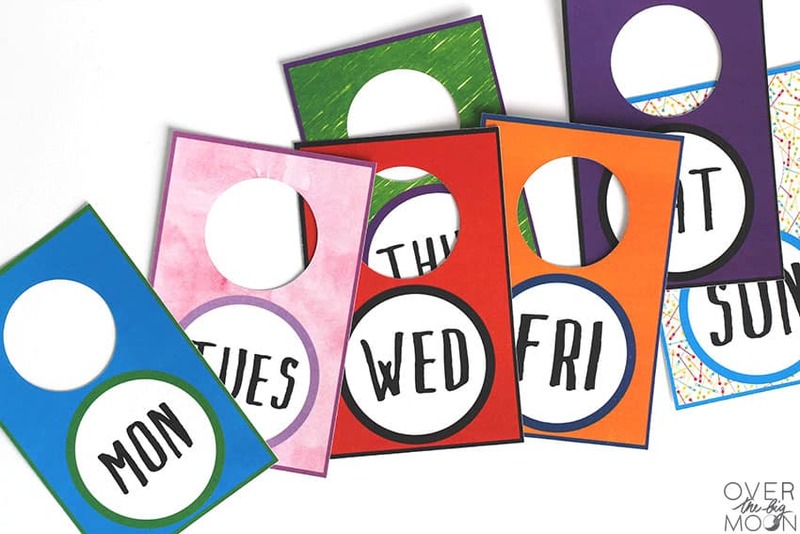 You can then Print THEN Cut each page OR you can Print each page and then go back and cut each mat. 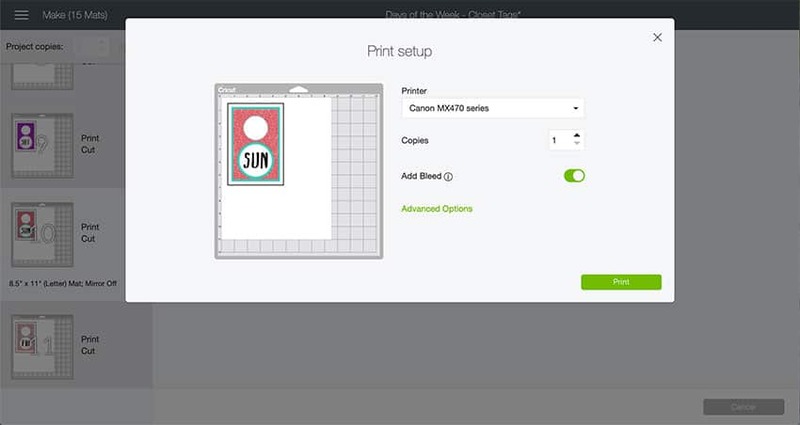 I personally prefer to click each mat and then hit SEND TO PRINTER. 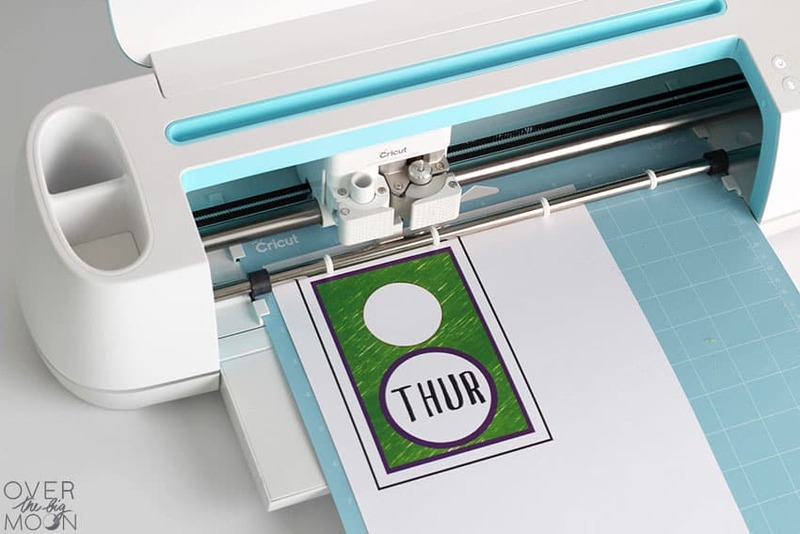 When you’re ready to cut, then load the page in the top left hand corner of a LightGrip Mat and load your mat in your Cricut Maker machine. Press the ‘C’ Button to begin the cutting. The Adaptive System will begin by scanning the black box around your design. Then it will cut the design out. 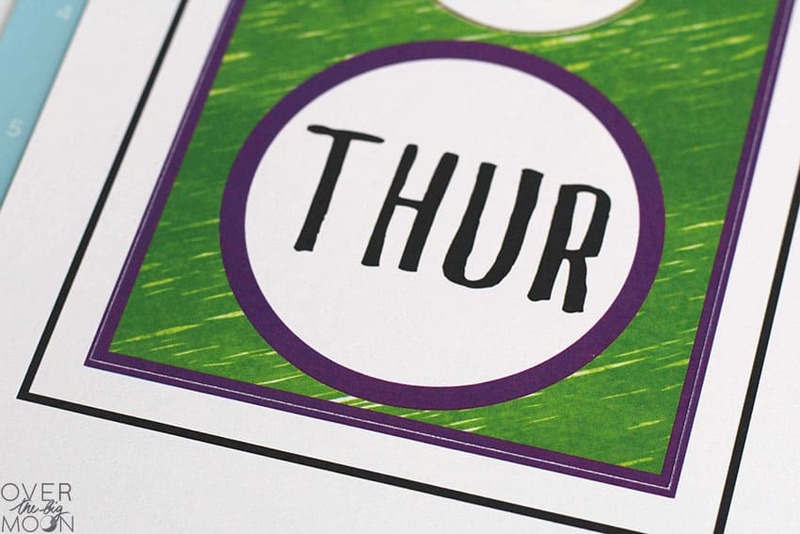 The design will print with a small bleed around the edges. This is to ensure that when it cuts it looks perfect! Below you can see what it will look like when cut! Then just put them on the hanger and you’re ready to go! 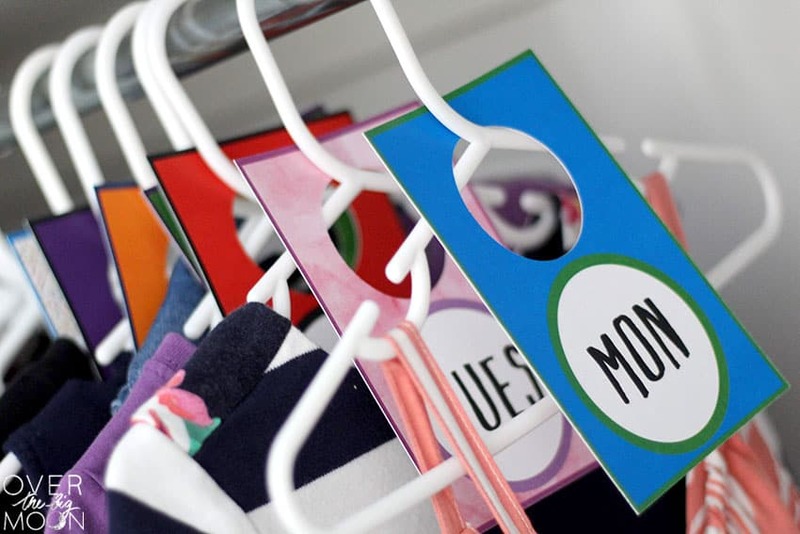 If you’re wanting to use more of a drawer system or clothes organization, check out these cute labels. 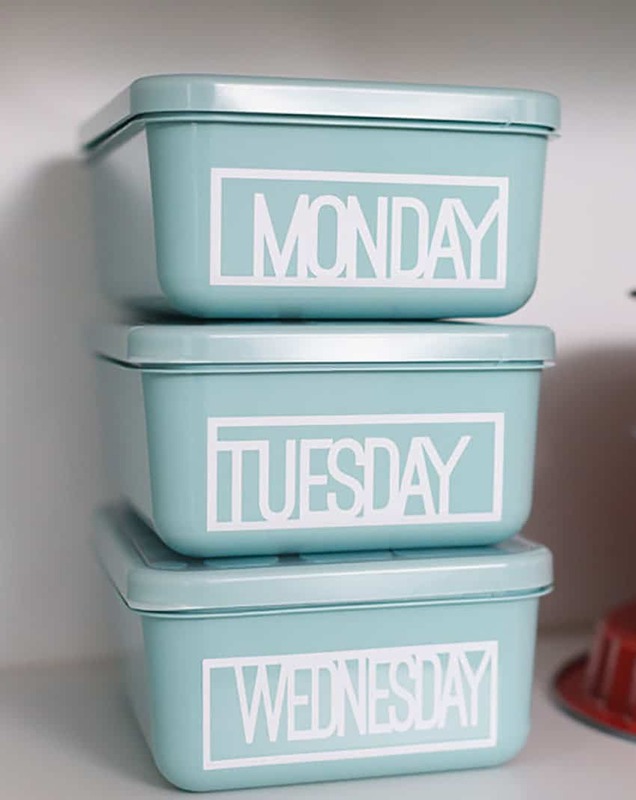 You could cut these out fo vinyl and put them on some stackable bins and they’d work great too! You can find this Vinyl Design Space File HERE!